Carmen’s green eyes light up when she talks about having water in her home. She’s lived in Candelaria for more than 25 years; she owns a small store where she has to keep the refrigerator, shelves, and the store space clean. To do this, she had to get up at 3 AM to walk to the well and carry buckets of water back. “Before, we had to carry water on our heads, sometimes two buckets of water on each trip. The well wasn’t so far away, but we had to go often and wait our turn to get out a bit of water,” remembers Carmen. Depending on the time of the year, sometimes they had to go down to the stream and dig holes alongside the creek to get water. “And this water was dirty and contaminated,” says Carmen. Now they have a water system with a tank that holds 25,000 liters of water with a water tap at each of the 79 households. “I keep the water tap clean; I put a fence around it so the children don’t damage it, and I have plants around it to keep it shaded,” says Carmen. “Now we are so happy because we have water right at our homes. It is a blessing,” says Carmen. They use the water to drink, cook, clean, wash, bathe, and to grow plants around their homes. New School Latrines in Masapa! The 66 children of the Camilo Ortega School in San Lorenzo are safe, healthy and happy with their fresh new latrines! One of their teachers, Maestra Mireya, tells the story: “In this school there was a big problem; the children and teachers did not have good latrines. We used to have an old latrine in poor condition." The teachers, students, and parents of the school were afraid that the latrine would collapse when the children were at school, and sometimes animals in the old latrine frightened the children. So, the concerned parents and teachers asked El Porvenir for support to build a new latrine that would be safe for their children. Working together, the parents, the teachers, and El Porvenir built new latrines. Maestra Mireya feels differently about sanitation at the school now: "I feel good that my students can go alone to the latrine because I know they are completely safe both physically and hygienically." In addition to the construction project, El Porvenir Health Educators assist with hygiene classes, stressing the importance of handwashing, teeth brushing, and good nutrition for good health. "Now, the children have new and safe latrines, and are no longer afraid. We are very grateful for the improvement this project brings to our school,” said Maestra Mireya. Ada García, 31, has a desire for self-improvement. All her life she has worked to learn new things and be able to put them into practice for the benefit of herself and her family. El Porvenir visited Ada’s community, Arenas Blancas, looking for people—both men and women—who were willing to learn to build latrines and toilets in order to train them. Ada was inspired by the idea, and she decided to participate. "Women can also do the work of a mason," expressed Ada. "First we were trained how to build latrines and toilets, and after that, we started to work. In the beginning, it was difficult for me to get the measurements right, but I learned and improved until the latrines and toilets were done well," Ada tells us. "After working in several communities, the time came to build my own toilet. I worked hard on this because I wanted it to look beautiful and perfect. Now I have my own toilet! I learned so much working with El Porvenir," Ada confirmed. "It was a good experience because it helped me practice my skills. Now, I feel confident that I can do this and whatever else I set out to do. Training people for this type of work—regardless of gender—and giving incentives to try new things gave us confidence,” said Ada. Cesar is one of the 425 people who live in Quizaltepe, San Lorenzo. There aren’t many employment options there, so many people emigrate to others parts of Nicaragua or Costa Rica for work. Those who stay work in agriculture. Cesar, 47, was born in Quizaltepe. 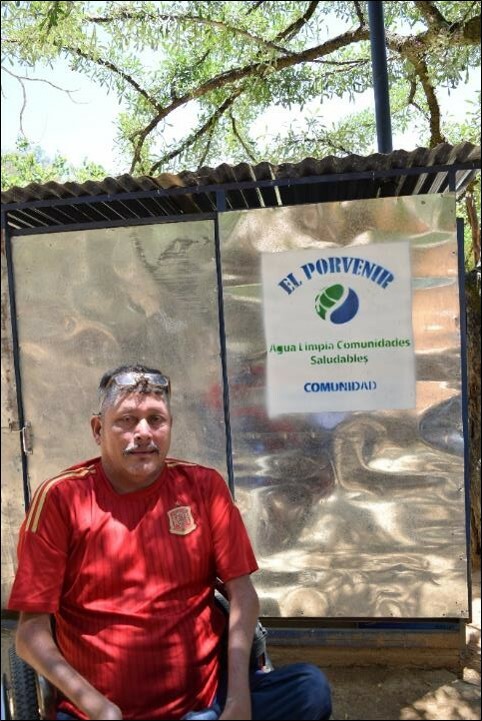 Before working with El Porvenir, he had never had a latrine. That’s true for most everyone who lives there. Cesar left school after 5th grade and his parents taught him to work the land. Cesar is married with 4 children, and he puts all his strength into providing for them. He sometimes goes to Costa Rica for work; the money he earned working there made it possible to build his own home—something he couldn’t accomplish with what he earned farming. About 15 years ago, a European organization offered to build latrines with the residents of Quizaltepe, but they only worked with 15 families. The children continued to get sick with diarrhea. Many of the families scraped together what materials they could to build their own improvised latrines: simple pits surrounded by black plastic, wood, and some zinc sheets for a roof. At least this kept the human waste out of their yards. Cesar had heard of El Porvenir from people in nearby communities, and he was curious if El Porvenir would work with them, too. Cesar: “One day, I made a decision to change things. When I went into San Lorenzo, I went to the El Porvenir office and asked how they work. They explained everything to me, and I felt I could trust them. I sent a request for support, and then El Porvenir came to visit and went house by house to talk with everyone. We realized that our needs were greater than just latrines. We needed potable water, electricity, and latrines. We felt so happy to have gotten a response and to feel like we were going to improve our lives. “Not only did El Porvenir work with us to build household latrines and improve our quality of life, but we all worked together to build double pit latrines at the school as well. I started training to be a volunteer community health educator even before the project began, and I’ve developed my leadership skills and problem solving skills. I worked enthusiastically along with my community to haul materials to each house and to help the mason. Wilber is the Las Cruces Watersheds Committee Coordinator. Part of this project focuses on conserving topsoil; to do this, residents have terraced, planted fruit trees and coffee, and planted trees like cedar. The residents of Las Cruces have worked to build 469 meters of rock terraces and 200 meters of live terraces made of grasses and trees to prevent soil erosion. Both kinds of terraces slow the speed of the rain water, allowing it to infiltrate into the ground and making the land better for crops. Mario contracted polio when he was five. He had high fevers and never walked again after that. He spent nearly eight years crawling anywhere he needed to go until someone donated a wheelchair to him. When the community members approached us and asked for support to build 25 new latrines, they told us about Mario. We were able to work with the makers of the latrine shells to create a sliding door on a bigger shell to make the latrine wheelchair accessible; we also worked with the family to pave a path from the home to the latrine so Mario would no longer get stuck in the mud. The inside design was modified as well to include a bench for transferring from the wheelchair to the seat. “This latrine works for me for my needs. It doesn’t matter if it rains, I can get my wheelchair into the latrine, and I have a seat where I can sit and do my necessities with ease,” he says with a big smile. Residents of El Caracol, Golondrinas, Terrabona have built fuel-efficient vented stoves, latrines, and a water system. They are also working to restore and improve their watershed. Water is always a great need. Before having a water system, the women had to walk up to 2 km to a river to wash clothes. “Now, we have clean water at each home—and a latrine, too—which translates into health for the community,” says Doña Rafaela. Some of the benefits that residents highlight are the workshops on how to use your latrine, hygiene talks at the schools, and when and how to wash hands. They also actively participate in and appreciate the community clean-ups of the river. “The best part is that this project hasn’t stopped like others that have come and gone in the past. The work with El Porvenir has continuity,” says Doña Rafaela. The community has changed significantly, according to Doña Rafaela: “Before, the children died of diarrhea, parasites, vomiting, fever—and it was because the community wasn’t clean. Above the water source, the animals roamed free. And that’s where our drinking and bathing water came from. This new stove uses 50-60% less firewood than a traditional stove and vents harmful smoke out of the home.